The grounds surrounding the historic Hexenagger Castle, situated in the village of Hexenagger in Bavaria Germany, bustle with life during the romantic Christmas Markets an annual event which attracts crowds by the hundreds. The Hexenagger Castle was first mentioned in the history books in the year 982 as a knights (or hunters) castle. The royal family Weidenbach who've occupied the castle since 1834, hold several events during the year. 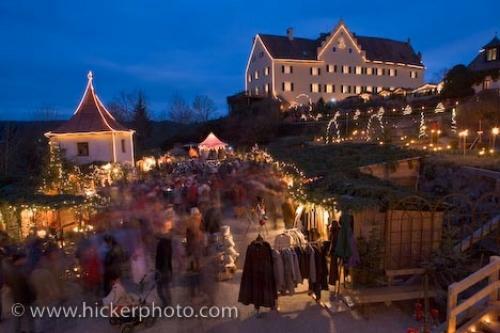 For four weeks before christmas, the Hexenagger Castle hosts the annual Romantic Christmas Markets each weekend beginning on the Friday and finishing up on the Sunday evening. The idea is based along the Advents calender or the 12 days of Christmas. Photo of the beautiful lights at the Hexenagger Castle during the romantic christmas markets, Bavaria, Germany. Night christmas lights at the Christmas Markets at the Hexenagger Castle, Hexenagger, Bavaria, Germany, Europe. I photographed this photo with the digital SLR camera model Canon EOS-1Ds Mark II, aperture of f/8.0, exposure time of 13/1 sec. on ISO 50, as always I used a original Canon Lens, the focus lenght for this picture was 24mm.